Overview: Located in the same neighborhood as the Carmanah/Sol head office, the Da Vinci Centre was a prime candidate for showcasing sustainability in the region. With many evening functions on the schedule, from cooking classes to weddings, this 4,000-square-foot event center saw an opportunity to add effective solar lighting for its parking lot. Requirements: The Da Vinci Centre needed lights that could be installed without disturbing the existing infrastructure on the site. Not only does solar lighting help reduce the overall cost by avoiding the need to trench for wiring, but it also keeps installation easy, especially for this type of retrofit. 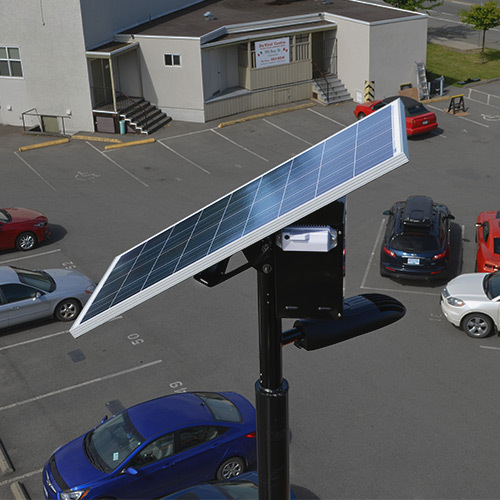 Our Solution: Sol provided two EverGenM Series lighting systems to illuminate the parking lot. With dark-sky friendly LED fixtures with a 3,000K light color temperature, the systems will provide focused, warm light for this mixed-use area.